– last day of work (of the week)? Yay, it’s that time again! Work day was overall smooth, but not as productive as things were getting wrapped up. My PM was out and I received no further instructions on my work, got stuck at some point. On the other hand, I had my beer during “beer hour” but some co-workers thought that was “once in a life time” thing, haha… I guess I was no longer the “water-drinking guy”! Had a good fellowship time at night, but a little too long for me… Left at 11:30pm, I kind of stayed up and watched “South Park” (influenced by Silky) and slept only 6 hours! – woke up (unwillingly) at 6:30am, got ready to started driving to office at 7am… An early work day? No way! It’s for our mountain biking trip, for I(we) have waited for so long. 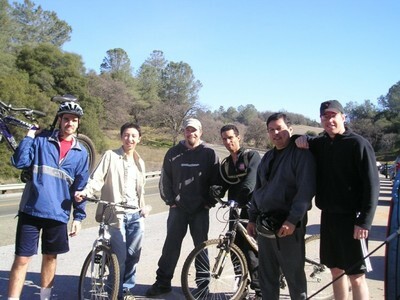 Arrived to the trail by 9am, the six of us (with six bikes on one of our PM’s truck, wow…) began our 11-mile journey. Man, the trail was quite rough and tough, full of ups and downs, perfect for full-equipped (with suspensions) mountain bikes, but NOT the one that I was riding on. Without front suspensions, my mountain bike, which was kindly lended by one good co-worker, was shaking like crazy when we were cruising downhill (so did my arms, as I gripped the handles so tight, esp. downhills)… Really, I am totally out-of-shape (I used to ride my bike around SLO back in my college days, but my bike was stolen on some unexpected days, ai…) At last, I survived without any injuries… Thank God for that! 2.5 hours of mountain biking surely made all of us to be tired enough, we went to some good old American restaurant for lunch… $8 for original [full size] double hamburger + fries + drink, good deal! Wed. (2/8) – started already? yeah… it’s after midnight, better sleep early !! !